A recent report published by EuroTest has shown the positives and negatives of the European car rental industry. 12 cities in 7 countries throughout Europe were chosen for the comprehensive study about the overall service that can be expected from the industry’s leading car rental suppliers as well as some smaller companies. The overall results showed that the level of consumer satisfaction is a combination of the customer service and the quality of the vehicles. Unfortunately, the results show that there is a low level of customer service in the car rental industry. The study was conducted by a group of EuroTest researchers that were posing as normal car rental customers. They rated each company on how well they performed during the rental procedure as well as the quality of the vehicle rented. There were 8 attributes that were ranked on a 5 point scale. Most of the companies scored well in the vehicle quality tests, but the majority of the companies scored poorly during the rental procedure tests. Only 2 of 60 companies were given an overall rating of very good. They were National Car Rental in Kos, Greece and the Hertz in Dubrovnik, Croatia. Vladimir Banovic, the Sales and Marketing Manager for Hertz in Dubrovnik said, “Hertz Croatia is very proud to be ranked as best car rental company in Dubrovnik and this rank is proportional with the same service level in all our offices in Croatia. Our experience in car rental business and our dedicated employees result that kind of success. This recognition is our obligation to keep our service on that level with ambition for verification and improving on daily base.” Contrarily, 7 of 60 companies were given the overall ranking of very poor. The most commonly attributes rated very poor were pertaining to the rental procedure. When Niksa Klecak, the General Manager from Kompas Rent a Car was asked about the data that points to their lack of customer service, he said, “We are not happy with the results. It is an embarrassing wakeup call and we intend to fix this problem straight away.” It is not just Kompas though, over 50% of the companies scored poor or very poor in the Rental Procedure category. In fact, only 2 companies were credited with an overall rental procedure of very good. Those were Locauto Rent A Car in Portimao, Portugal and Europcar in Marmaris, Turkey. Even the internationally known companies posted bad ratings in this category. 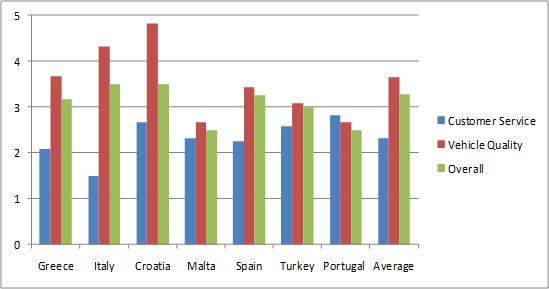 This chart shows the average attribute scores for each country in the survey. Croatia was the best for vehicle quality and the best overall. Italy had the worst customer service while Malta and Portugal tied for the worst vehicle quality. Portugal had the best score for customer service. The data also points to trends that are noticeable throughout the countries in the survey. Croatia topped the list for providing the best car rental services overall. Hertz, Suntrust Rent A Car, Budget, HM Rent A Car, Kompas Rent A Car and Avis all scored an overall rating of at least good. However, the positive scores were mostly related to the performance of the vehicles because Budget was the only company that had a higher than acceptable rental procedure rating. 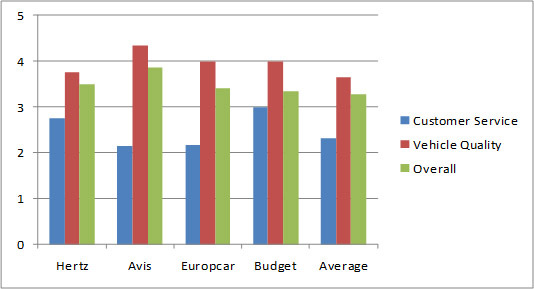 This chart shows the average attribute scores of 4 major car rental companies in the survey. Budget had the best customer service while Avis ranked the best in vehicle quality and overall. Every company ranked poorly on the customer service level. The report basically paints a picture about car rental companies that many people already know. And that picture is one of disgraceful customer service. It is unfortunate that so many companies are treating their customers in such an unruly manner. The customer is after all the source of income for the car rental supplier. The positives about the report is that most of the cars are in good working condition and customers can at least be confident to receive a quality machine. It is uncertain what the ramifications of this report will be, but one thing is painfully obvious; poor customer service is the norm. Do not expect to be treated like a king or queen at the car rental desk. Expect to be treated poorly and enjoy the pleasant surprise if the opposite occurs. [GET] Rental Car is one of the top internet car hire brokerage companies and are based in San Diego, CA. The company is currently serving approximately 25000 locations worldwide. For more information find them on the web at www.getrentalcar.com.